After reviewing the legendary Batman and Superman shows, it’s time to look at something that’s on a lower level. The Hulk show is essentially in the current Marvel show continuity, which means that you can expect a whole lot of comedy with a touch of action at some points. It doesn’t work as well as Ultimate Spiderman or Avengers Assemble, likely because the characters aren’t as interesting. It’s not a bad show and still looks good when placed next to Pac Man, but I can’t really say much for it. Ah well, it made for some good times. The show ran for 2 seasons and actually had a bit of a long running plot. Rick Jones was turned into A-Bomb due to gamma exposure and one thing led to another so he became the Hulk’s teammate alongside Red Hulk and She Hulk. He decided to start a webshow which would prove that the Hulks are actually heroes. A mysterious being known as Skaar appears and is defeated by the heroes so he joins the team. The 4 of them stop many local threats, but there is typically a mastermind in the shadows. His name is the Leader and I hope you like him since the guy will be a major recurring villain throughout the entire series. The heroes humiliate him in every way possible, but he never stands down so you’ve gotta like his determination. Another plot that comes back a lot is the Kree as Ronan is always trying to get revenge against the Hulk and even the Avengers have to step in at one point. Depending on how much you buy the whole quantity vs quality, you’ll like the fact that the Hulk show has a lot of guest stars. Some of them actually look good too so that’s definitely a nice plus. They certainly help to spice the show up and provide us with a little variety. Without the guest stars, the Hulk show would likely not be nearly as interesting. As with the Superman and Batman show reviews, let’s take a look at some of the good and bad episodes here. I’d say that the opening two parter was good as we got to see Hulk fight Skaar and there was certainly a lot of action. Another good episode was when the Hulk’s personality switched so that he became an intellectual who didn’t fight except as a last resort. We got to see the Hulk think his way out of his problems, which was a nice twist and blew the Leader’s plan away. A few of the other nice episodes which didn’t involve guest stars included a challenge by the Titan Xemnu, as he fought all of the Hulks. His physical power was incredible and the fight was actually quite good. Likewise, I liked a roller skating episode that came shortly afterwards as the heroes got to test their skills. Most of the episodes with guest stars were naturally a lot of fun. One of the highlights was when Ghost Rider appeared to drag Red Hulk to Hell. It was an intense episode and Ghost Rider was definitely given his due respect. He looked very powerful as he should and was no nonsense. The Avengers get to help out in the final two part episode against the Kree. The episodes were a little light on actual action scenes, but it’s always nice to see the Avengers show up and remind us that continuity can be real. It’s like jumping into the Avengers Assemble show. The Guardians of the Galaxy also showed up a few times and it’s always nice to see them. They even got to be in a Christmas episode and there aren’t too many shows which let Christmas appear anymore so that was neat. I think all shows should have a Christmas episode at some point. Dr. Strange helped out against Dormammu and his Mindless ones. 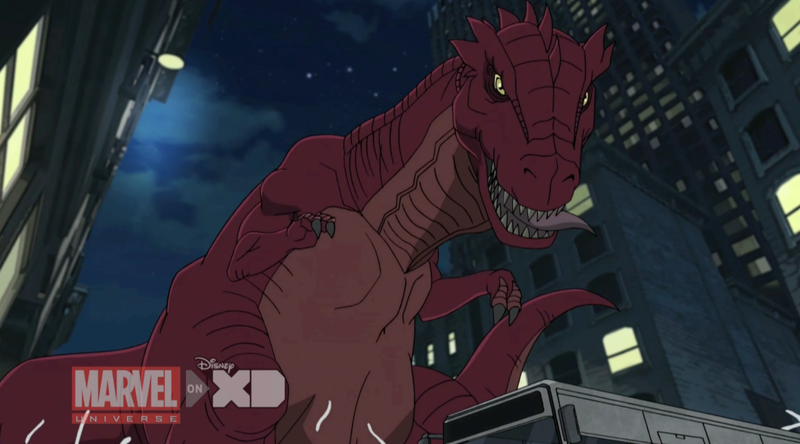 Those Mindless ones would eventually appear in Avengers Assemble and Ultimate Spiderman so they definitely get around. Even the Silver Surfer showed up in one episode to fight off some nightmares. His voice was admittedly very anticlimactic and not one that I would have chosen for the character. Still, I always liked the Surfer so seeing him back in animation again was certainly cool. 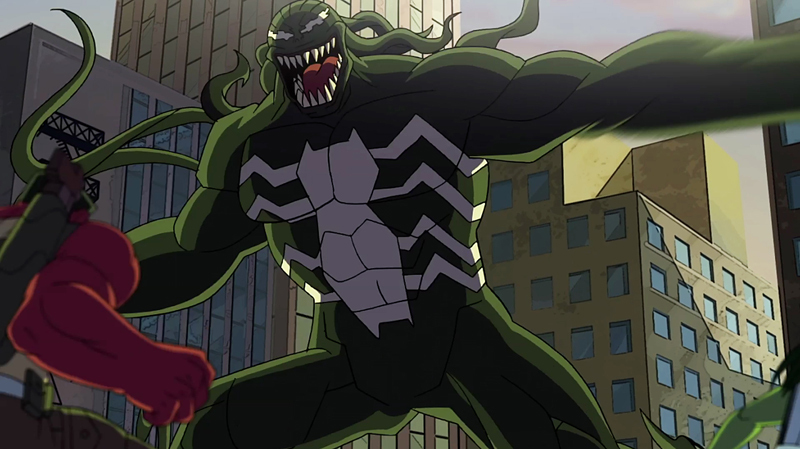 Spider Man was also around a few times and he even got to take on Venom in one of the episodes. It was definitely neat to see the Wall Crawler show up and he always makes for one of the best guest stars with his epic quips and constant readyness to show up the Hulks. Deathlok and the Inhumans also appear in the series. Things get a little dicey for Black Bolt and his friends as they get trapped within a dome, but the Hulks are always ready to help out. The fight with Deathlok was also fun and his guns sure pack a punch. That fight should realistically be a cakewalk for the Hulk, but we’ll just say that he was holding back. The Thing helps out in one episode although his rivalry with the Hulk doesn’t quite work as well when the Hulk is in full control like he is here. It’s just there, but it doesn’t feel as natural. Aside from being on the Avengers, Thor, Captain America, and Iron Man all get episodes in the series. Iron Man probably has the best role as he mostly sticks in character although his defenses shouldn’t be able to be hacked so easily. Captain America gives up on hope with his episode very quickly, which was more than a little iffy. The worst would tragically have to be Thor. In one episode, the Leader becomes the All Father so Thor and Loki decide to serve him regardless of how evil he is. Apparently, they must follow whoever is on the throne as if they were from the Shiar. That’s completely out of character for Thor and it was just odd. The writers clearly didn’t know what to do there. One of the episodes that definitely wasn’t very good was when the Hulk decided to live underground because the mole people were his true friends. It was pretty hilarious to see how easily Hulk was willing to ditch the surface dwellers, but it still didn’t make any sense and any episode with the Mole Man will typically get a thumbs down from me. Mission Impossible Man was another miss episode. I definitely don’t care for the Impossible Man as a character and this certainly did not increase his chances of being a likable character. We also can’t forget the Planet Hulk two part saga as Ego The Living Planet is involved in a huge twist, which was not a good one. There was also more crude humor than usual to be found there. I’d say that most of the Hulk episodes were decent. The only bad ones were really the episodes that overdid it with the humor. That just happened to a lot of season 1 episodes as they would sound good on paper and then get a little gross while watching. Season 2 improved on this, they never became perfect, but you could actually go through some episodes without major crude humor attacks. That was a start, but the series never got to see if it could really go on a role. Time to talk about the characters. Hulk is the lead and he’s definitely very heroic. You wouldn’t know it at first glance, but he really cares about everyone’s safety. Hulk’s a very selfless hero and also quite intelligent as this incarnation seems to have Bruce’s smarts along with his typical strength. He rarely ever enters into a rage and is always portrayed as the most capable hero while also being the strongest. Hulk’s essentially the perfect lead. He may make a mistake once in a while, but Hulk always gets the job done, even when the other heroes don’t believe in him. She Hulk doesn’t like the cold, but aside from that she is always one of the more reasonable characters in the show. She has a very inconsistent rivalry with Red Hulk that shows up once in a while. She Hulk may not be as strong as the Hulk, but she helps to remind him not to lose control at certain points and she always has a witty remark at the ready. Red Hulk is essentially a one dimensional version of Vegeta who tries to act as tough as the Hulk even when he knows that the Hulk is actually the stronger, smarter fighter. He is always upstaged, but he continues to talk tough in every episode so I suppose that he deserves some props for that…I guess. A Bomb is the comedy member of the group so he’s always thinking of some quick lines to remind everyone why he’s so tech savvy. He can turn invisible, which is a great trick, but this is Rick so he doesn’t use it as well as he should. He’s a fairly likable member of the group, although I prefer Red Hulk and She Hulk. The worst member of the team is easily Skaar. Skaar is basically here for the crude humor jokes and they can get quite disgusting at times. It’s best to just forget about him as he never contributes to the show and just brings it lower and lower. As for the villains, the Leader is certainly the main one in the show. The Hulks won’t rest until they’ve thoroughly humiliated him in every sense of the word over and over again. They force him to plunge their toilets and work at a fast food joint among other things. The Leader puts up with it because he wants to be ruler of the world someday, but it is pretty embarrassing for his fans. His plan with Skaar was also poorly thought out to the point where you will wonder what the point of it is. His whole “Query..etc etc, Answer, etc etc” gimmick was pretty neat though. This is mainly just because the Leader’s voice was spot on. He sounds bored with every line that he utters and while the other villains also push him around, the Leader never loses his confidence. As for the Abomination, he’s essentially a stronger version of the Leader. He doesn’t get quite as many good lines, but he almost takes down the team a few different times and he even took over the base at one point. Abomination can be a little generic, but he was certainly given more credit here than in Avengers EMH so that’s a good thing. He’s finally almost on Hulk’s level in strength like he’s supposed to be. He even took over a town, which was very…interesting to say the least. Normally, I like to talk about how good the animation is, but I can’t really say that this time. Whoever draws the character does not know how to draw teeth, as they are simply too big and stand out way too much. Think of the classic shows like Justice League, Spectacular Spider Man, or the old Transformers show. Do you remember the teeth? Naturally, the characters had teeth and smiled sometimes, but you didn’t notice a giant pair of teeth every time they talked. That’s what happened in the Hulk show and it can be quite distracting. The fight scenes can be decent when they happen though and the character designs are good. It’s similar to how Accel World’s animation was terrific, except for the human characters. As with this show, it’s a big enough negative that you have to take a double take. I’m going to give the Hulk show a bit of a thumbs down here, but it has its moments. As for the soundtrack, you’ll probably forget it right away. This isn’t the kind of show where you will typically remember the music. That being said, I do remember Red Hulk’s theme because it plays whenever he fights or has a meaningful scene. It’s essentially a generic “tough guy” theme, but that doesn’t stop it from being decently good. At least it was memorable and maybe that’s all I could have asked from it. The show did need a theme song though. I don’t see why everyone is ditching the theme songs nowadays. They were classic and theme songs help to take a show to the next level! One unintentionally humorous thing from the show was that the very first episode had a plot hole. It ended with Rick being taken to the base to heal, but in the second episode, Hulk never actually made it to the base. Whoops…heh heh. It’s something that you would expect from the Hulk show, but at the same time, you didn’t expect it to happen so soon. It had a retro vibe to it I suppose, but it’s something that you’d think the writers would have noticed. Especially since it aired as a two part event. 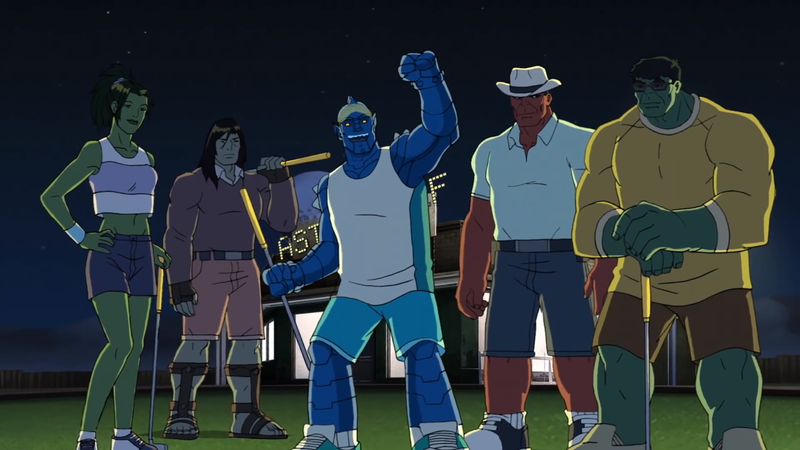 While the Ultimate Spiderman show has the gimmick of Spiderman constantly breaking the third wall and stopping time, Hulk goes for a more practical option. At the end of every episode, he’ll sit down in front of the camera and explain that episode’s moral in case you missed it. The messages are more inspirational and heartwarming than My Little Pony Friendship is Magic. Now, that’s a little bold to say as My Little Pony has some of the best messages out there, but Hulk teaches you about caring for your family and teammates, ignoring any bad qualities they may have and focusing on the good, how problems shouldn’t always be solved by violence, trusting in your teammates, and dozens of other great morals. It’s never handled very subtlety, but sometimes that’s a good thing. Being able to talk about these things with a straight face is a good thing and the Hulk show is great for impressionable kids you are watching the show. One of the things that really bogged the Hulk show down was the unfortunate crude humor and the uninspired dialogue. While the crude jokes are not as frequent as Pac Man (That would almost literally be impossible) they can definitely get pretty dicey at times with a lot of sneezing and potty jokes. They force the Leader to live in the bathroom for a while and the toilet is clogged so he has to try and unclog it. It gets preeeetty dicey for him to say the least. If there is a crude humor joke to be thought of, it’ll be in the show and it certainly gets old. The obvious puns and gags from A Bomb and the others can be good as long as they stick away from that area. Ah well, I guess the show didn’t want its solid seven. Without that, the show would have been decent. It would have been similar to shows like Avengers Assemble and Ultimate Spiderman. I would never go as far as to call them great shows, but they were still fun and add to the mythos of the characters. I’m still really glad that those titles are around and I can’t say the same for the Hulk title quite as easily. Even this upcoming rating that it got is very close as you can make a decent argument for one star lower. I think it was just good enough, but it was definitely on the edge. 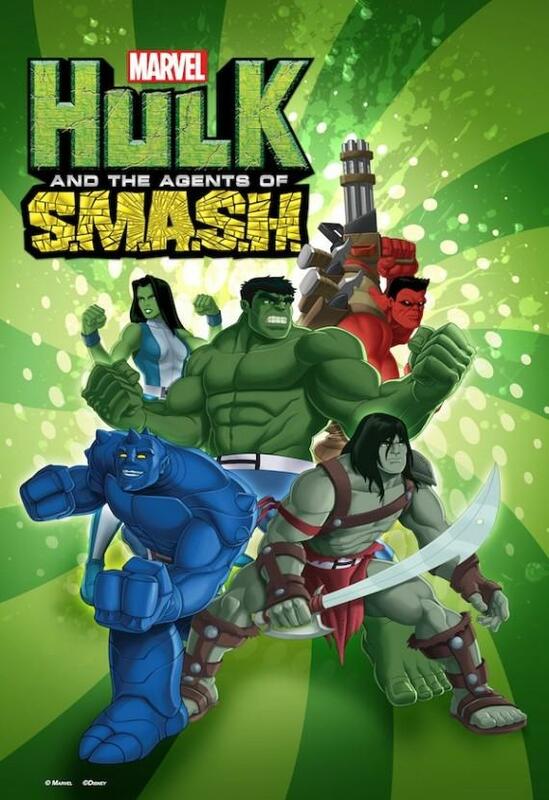 Overall, Hulk and the Agents of S.M.A.S.H. is a show that had potential. It’s essentially a Marvel version of Batman Brave and the Bold, but with less guest stars, sloppier animation, and inferior writing. Also less of a soundtrack, but that’s to be expected. It couldn’t quite keep up with the Avengers or Ultimate Spiderman. It should be really thankful that it got a season 2 as that saga certainly helped the show improve. Otherwise, I’m tempted to say that it could have gotten a 5. Still, there were enough positives for me to call it a decently good show and I’d recommend it to Hulk fans who wants to watch some fun action. That being said, you’d be better off watching the 90’s Hulk show or just going for Avengers EMH. I’m confident that Guardians of the Galaxy will beat the Hulk show so maybe everything will start to look up from here…maybe. Also, make sure that you stick around for the moral at the end of each episode! This entry was posted in 6 Star TV Shows, Reviews, TV Show Reviews, TV Shows and tagged Action, Agents of S.M.A.S.H., Avengers, Comedy, Guardians of the Galaxy, Hulk, Marvel, Marvel comics, Marvel Review, Review, Superhero, The Incredible Hulk, TV Show Review by dreager1. Bookmark the permalink. Yeah I really can’t bring myself to watch it. I can’t even…..you’ve gotta watch it Destroyer! See Reager, I know I’m not going to watch the show beyond the first episode. So I see no point in wasting time with the first. I dunno, passing on the Hulk show might not be the best move. It’s not completely unbearable and was a decent start to the show. It’s like watching Ultimate Spiderman without Spiderman. We know that you won’t stick with the Hulk show, but at least you can say that you’ve seen it. …You win this time Reager. I’ll check it out soon.